ITU regions and the dividing lines between them. 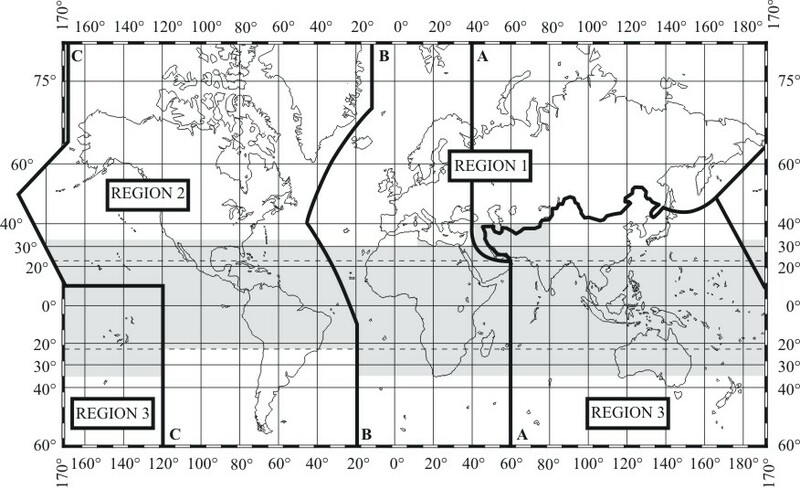 The International Telecommunication Union (ITU), in its International Radio Regulations, divides the world into three ITU regions for the purposes of managing the global radio spectrum. Each region has its own set of frequency allocations, the main reason for defining the regions. Region 1 comprises Europe, Africa, the former Soviet Union, Mongolia, and the Middle East west of the Persian Gulf, including Iraq. The western boundary is defined by Line B. Region 2 covers the Americas including Greenland, and some of the eastern Pacific Islands. The eastern boundary is defined by Line B. Region 3 contains most of non-FSU Asia east of and including Iran, and most of Oceania. Line B is a line running from the North Pole along meridian 10° West of Greenwich to its intersection with parallel 72° North; thence by great circle arc to the intersection of meridian 50° West and parallel 40° North; thence by great circle arc to the intersection of meridian 20° West and parallel 10° South; thence along meridian 20° West to the South Pole. The definition of the European Broadcasting Area uses some of the definitions of Region 1. ^ "Radio Regulations". International Telecommunication Union. 2005-09-08. Retrieved 2006-07-18. This page was last edited on 9 December 2018, at 22:36 (UTC).